Police in Chechnya have arbitrarily arrested Oyub Titiev, head of the local office of Memorial, Russia’s leading human rights organization, on bogus drug possession charges, Human Rights Watch, Amnesty International, Front Line Defenders, FIDH and the World Organisation Against Torture in the framework of the Observatory for the Protection of Human Rights Defenders, the Norwegian Helsinki Committee, and International Partnership for Human Rights said today. 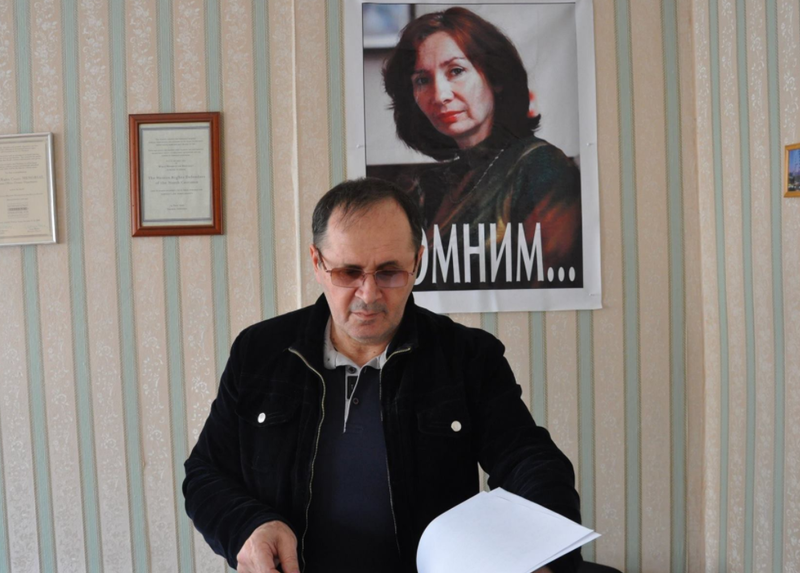 Authorities should immediately free Titiev, drop the charges against him, and stop hindering the work of human rights advocates in Chechnya, the international human rights groups said. Police arrested Titiev, 60, at approximately 10:30 a.m. on January 9, 2018, near Kurchaloi, a town 30 miles from Grozny, the Chechen capital. One of Titiev’s friends told Memorial that he saw Titiev standing by his car on a local road near the Khumyk river bridge, surrounded by five or six police officers. The same witness said that when he later went to the Kurchaloi police department to look for Titiev, he saw his friend’s car parked outside. A lawyer sent by Memorial went to the police station in the early afternoon, but police officials did not acknowledge Titiev was in custody and did not let him in. In the early evening, Chechnya’s deputy interior minister informed Russia’s federal ombudsperson, in response to her inquiry, that Kurchaloi police had detained Titiev. The lawyer was then admitted to the station. Russian law provides that authorities can hold a person for up to three hours before formally placing them in custody, but the detainee is entitled to access to a lawyer as soon as they are detained. Titiev had access to his lawyer only after almost seven hours, and when the authorities issued the official report registering his detention, they listed the time of detention as 8.10 p.m., approximately 10 hours after he was first in their custody. “The detaining authorities refused to provide any information about his whereabouts and fate for close to seven hours, in violation of international due process standards, raising a real concern that they may have been trying to forcibly disappear him,” said Andrew Anderson, director at Front Line Defenders. “Russia has an obligation under international human rights law to immediately register and acknowledge all detentions, and allow detainees access to their lawyers, a fundamental safeguard against ill treatment and enforced disappearances,” said Denis Krivosheev, head of the Eastern Europe and Central Asia Regional Office at Amnesty International. The police told the lawyer they had allegedly found 180 grams of a marijuana-like substance in a bag in Titiev’s car and that Titiev was under investigation for possession of an illegal drug. Titiev denied the allegations and insisted the bag had been planted by police. If convicted, Titiev faces a maximum 10-year prison sentence. The human rights advisor to Russia’s president, Mikhail Fedotov told the press, that Titiev’s case may constitute a fabrication and the investigation authorities should look into the issue. The rights groups called on Moscow to ensure that Titiev is immediately released, that there are no further threats to his security, and that human rights groups can carry out their work in Chechnya safely. Nils Muižnieks, the Council of Europe Commissioner for Human Rights, issued a statement expressing concern about Titiev’s arrest, questioning the “dubious charges that lack credibility” and calling on Russian authorities to immediately ensure his release. Russia’s international partners should follow Muižnieks’ example and publicly express their objection to this attempt to silence Memorial and urge the Kremlin to secure Titiev’s immediate release and continued safety. “Bogus drug-related charges and planted evidence are a regular tactic that Chechen authorities have used to punish and discredit their critics,” said FIDH and the World Organisation Against Torture in the framework of the Observatory for the Protection of Human Rights Defenders. In the summer of 2014, a court in Chechnya sentenced local activist Ruslan Kutaev to four years in prison on fabricated, politically motivated drug charges after he criticized and disobeyed an order by Chechnya’s leader, President Ramzan Kadyrov. Kutaev was paroled in December 2017. In 2016, another Chechen court sentenced journalist Zhalaudi Geriev to three years in prison on similarly fabricated drug charges. Geriev reported for Caucasian Knot, an online outlet that reports extensively on Chechnya and that has criticized Chechnya’s leadership. Memorial has monitored abuses in Chechnya for more than 25 years, reporting extensively first on abuses by federal forces during the two Chechen wars, and then on violations carried out by local authorities with the Kremlin’s tacit blessing. During the past 10 years of Kadyrov’s rule in Chechnya, Memorial has published hard-hitting exposés on collective punishment practices, enforced disappearances, torture and other ill-treatment, punitive house burnings, and extrajudicial killing by local security officials. They have consistently described contemporary Chechnya as a totalitarian enclave within Russia, noting Kadyrov’s interference in virtually all aspects of social life, including politics, religion, academic discourse, and family matters. Titiev has led Memorial’s work in Chechnya since 2009, after the kidnapping and murder of his colleague Natalia Estemirova. His arrest follows years of threats and smear campaigns by Chechnya’s authorities against Memorial and other human rights groups. Kadyrov and other Chechen public officials routinely vilify human rights defenders as “puppets of the West” and “enemies of Russia” bent on destabilizing Chechnya. Some activists also suffered attacks and harassment by local security officials or pro-government thugs.